Thinkin About It – Future Archives ? — Okay, let’s see. I can’t say this morning got off to a rough start because I’m still up since last night. The computer I rely on the most, the one I’m writing this on right now, is going blind on me- if I’m doing any graphic-heavy 3D stuff- the monitors suddenly go black and say “hey- we’re not connected to anything-” and since I got this computer specifically to work on completing my game world, and the game that’s supposed to happen inside that world- this is disconcerting. I better look up the spelling on that one, it doesn’t look right. Must be okay, the spell checker doesn’t like words with dashes attached to them, but ‘disconcerting’ passed their test. — But- on a lighter note – I did download over 750 photos (not all of them worth keeping) onto three different computers last night while dealing with computer catastrophes. The stupid ‘We know better than you do what you want to do’- routines inside one computer decided that I wanted all 757 photos to go get lost somewhere on a cloud, and told me my drop box was full. So I swore at that computer and told it to take those photos down from the flippin cloud and put them in a nice new file on my desktop. When it – obviously scared half to death – did what I told it to, I discovered a couple lost gems in that flippin cloud, that I never wanted anything to do with in the first place. No danged cloud has any business grabbing my stuff like that. And, oh yeah, the nearly lost gems on that should be lost cloud? 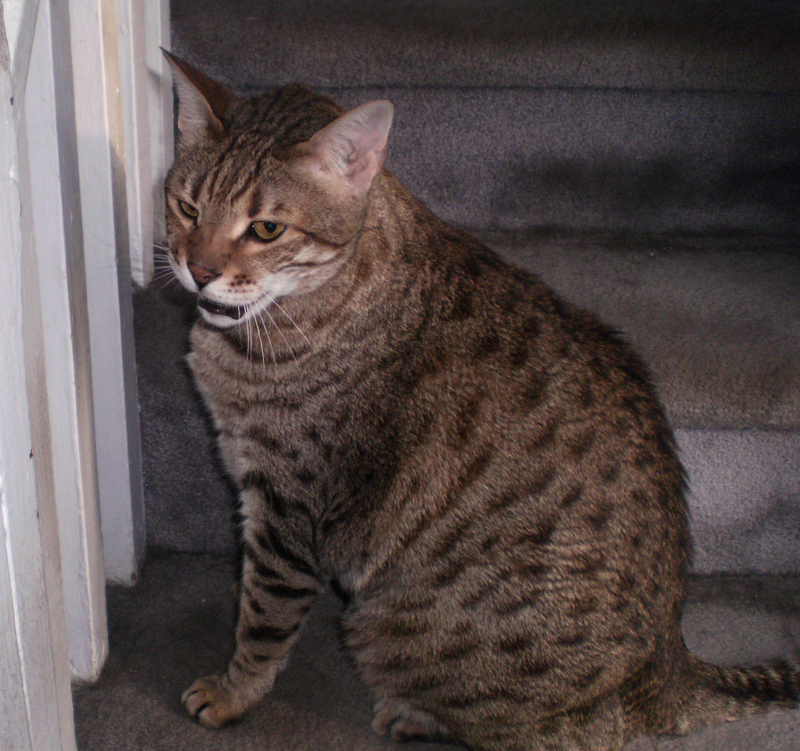 – the above photo of Domino the Bengal Cat was one of them. Yum. — And now I should belatedly get my posterior to bed. I’m going to skype with mom tonight, and she’s delighted to be able to see me and hear me when I do that. And now that I got my grumbling done, I won’t have to darken our conversation tonight with angry thoughts about ice holes who so freakin cleverly design things to fall apart a long time before they need to. – I won’t say, “May they rot in hell.” Because we’re already there, so how about, “May they open their eyes and realize they’ve created a living hell for themselves right here and now.” – Shrug. I often think I wouldn’t wish that on my worst enemy, because I don’t collect enemies and sort them according to how rotten they are to their cores- But- Waking up in hell is a blessing that us truth-seeking ‘Angels-In-Training’ wish upon ourselves so we can continue our mission to manifest Heaven on Earth. & No, it’s not too late to keep trying to do that. Thursday, June 18, 2015 -( 16°C / 61°F & Sunny with scattered clouds @ 9:30 am in Atlantic Canada )- Today might be Paul McCartney’s birthday. Kaelyn planting flowers in the hills of Aerendel. Jim W used this screen shot for his new twitter background, Kaelyn got lost behind the tweets. – Oh, When you’re building a gaming world, you need to have a builder character in the area you’re creating and/or improving. That’s where Kaelyn came in. She’s a world improver. — So we had a problem with a web provider. They claim our site was infected because we hadn’t purchased their security service, we did, but they wanted us to purchase their premium package which costs twice as much per year as their quoted price from their yearly hosting package. —The odd thing is, they shut down our site on almost the same day as a guy who wrote a book on cyber-security fraud and extortion, claiming the U.S. Government is involved in a conspiracy to grab total control over everything on the internet. Part of this alleged plot involves cyber-security firms that appear to be a private industry on the surface but were found to have deep ties with the US Government when the author dug deeper. — We contacted the author with a fairly wordy play by play description of what we were told and he told us to scrap the web provider and go with somebody bigger, who has more to lose if they’re caught with their hands in your cookie jar and somebody sees the US Federal Trade Commission pulling their strings behind the curtain. He suggested GoDaddy? We gotta think about that. Meanwhile, if any of you want to see what happens when extortionists shut down a web site for thinly veiled attempts to extort $189.99 per year above and beyond the $131.88 listed ‘renewal’ price. They’re currently claiming an introductory rate of $15.00 for the first year. If you’re considering going with a company that calls itself ‘Fat Cow web hosting’, think again. Look them up on your favourite search engine and visit their propaganda page on the web. Then look at http://www.aerendel.ca/blogz.html and pay attention to all the error pages they plastered on any page to ‘aerendel dot org’ that comes up. — Shrug, check back here in a couple weeks or more to see what we decide to do. is about to transpire on August 23rd.